Get the most out of Tuscany on this 3-hour private food and wine tasting tour with private guide. Follow your guide to some of the most popular areas of the region, while sampling tasty Italian foods and wines along the way. Stroll through Piazza della Signoria, see Ponte Vecchio, and stand next to Duomo (Cathedral of Santa Maria dei Fiori). Stop to sample gelato, and enjoy a glass of wine with crostini at a local winery in Florence’s Oltrarno quarter. Meet your private guide in front of the central entrance to Duomo (Cathedral of Santa Maria dei Fiori) a little before your departure time. This is a private tour, so please list any special interests you have (art, architecture, history, culture) at time of booking to alert your guide, so that he or she can better prepare for your private tour. Your group sets off on foot, and follows your guide around some of the most well-known spots in the Tuscany region, including Florence, of course. Stroll down the streets that Dante himself once did, and enjoy the views of the surrounding buildings. 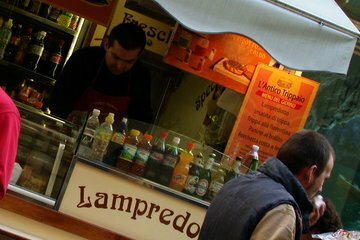 Stop to taste lampredotto, a dish made from the stomach of a cow, which is loved by most Florentines. Continue on as your guide tailors his commentary to your interests. He or she will also go into how food and wine played a huge part in this Italian region. As you make your way to Oltrarno, pop in one of the local wineries for a glass of wine and a tasting of crostini — a popular Italian appetizer. Some other key sights you can see on your journey include Uffizi Gallery, Piazza della Signoria, and Ponte Vecchio. Also, get a taste of gelato before your private tour ends.